Thompson Reuters (who produce the Institute for Scientific Information journal impact factors) have released the first update of Highly Cited Researchers in the sciences and social sciences since 2004. I note that Australia is well represented in the Environment/Ecology field of research in particular. 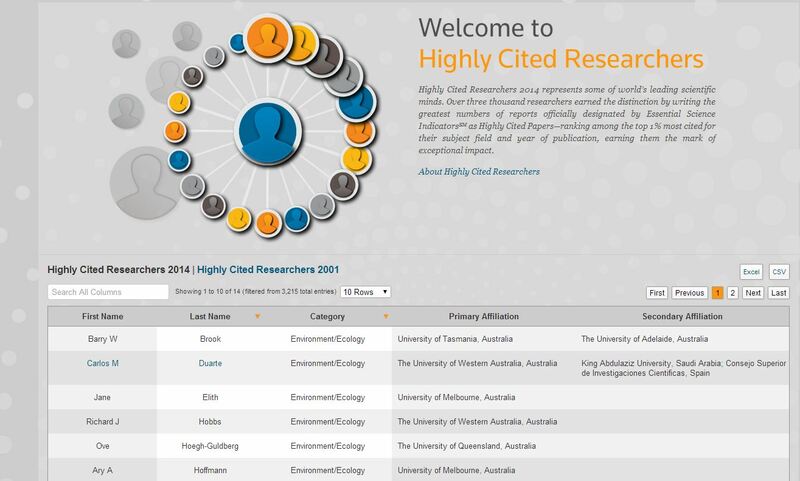 The background and methodology of “Highly Cited” is explained here. In brief, it’s derived from Essential Science Indicators data, and is based on the number of top 1% cited papers (in the peer-reviewed literature), by field and year, that a scientist has accumulated over a 10-year period (as indexed in the Web of Science). You can see my ResearchID profile here and my ORCID here, which shows all my publications. I also have a Google Scholar profile, which is based on a different method (not as rigorous as ISI, as it is prone to picking up various web-based [non-peer-reviewed] citations). Congratulations — well done ! Your contribution to improving public education about these important subjects is outstanding. In fact, I am hoping to do a little bit of this myself in October. I attach a draft flyer about an event my Chemical Engineering Class of â64 at the University of Queensland is putting on in Brisbane to mark 50 years since our graduation. I will be teaming up with Professor Eric McFarland to talk about why Australia should put advanced nuclear power on the table for consideration. I hope we can attract young professionals from many different disciplines to come along, because it is there future we will be talking about. Keep up the good work. I couldn’t find Mark Diesendorf, but he is not a favourite. He does not seem to want to engage in communication with those outside his narrow peer group, so I should not be surprised. Congratulations to you Barry. You deserve the recognition. That list of publications is pretty useless without links to PDF files. Many of them would be interesting to read, but one cannot.